A week's free trial of the patches - part of the NHS Stop Smoking Quit Kit - will be available at many chemists for the first time from 1 January. Health Secretary Andrew Lansley told the BBC he hoped people would then complete the full course. 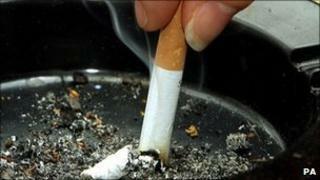 Charity Action on Smoking and Health welcomed the move but said the scheme had not been advertised properly. Mr Lansley said: "We're hoping, starting on Saturday, and working with our partners in pharmacies across the country, that more than 400,000 people will try to give up smoking using the Quit Kits supplied by the Department of Health." The Department of Health has ordered 300,000 of the kits and has an option to buy an extra 105,000 if demand is high. A spokesman said the government estimated that one third of those who requested the kits would then use the vouchers to get their free nicotine patches. Mr Lansley added: "It's twice as effective as other mechanisms in helping people to give up smoking." Although a limited number of the Quick Kits containing vouchers for the free patches can be ordered online, most will be available at pharmacies across the country. Mr Lansley said the government was encouraging people to quit as "smoking is still the greatest avoidable cause of early death in this country". He added: "Up to 80,000 lives a year are lost as a consequence of smoking and 400,000 hospital admissions a year are directly associated with the impact of smoking. About 90% of people who have lung cancer have smoked at some time." What worries me is that many smokers who could benefit from this may not find out about it. He admitted that those wishing to kick the habit may need more than a week to do so. The government and kit suppliers Novartis and GSK had concluded that a week's free supply was "a very good basis upon which smokers get started." "If they complete the course, there is a good chance they will remain smoke-free thereafter," Mr Lansley said. The government has spent around £1.80 on each kit, which also contain health plans and other devices to help people give up smoking. The NHS has published advice online about how to use the patches and what risks people need to consider if they do decide to try them. The Department of Health spokesman said the government had negotiated a heavily discounted price for the patches but was unable to give any further information about the cost. Retail packets of nicotine patches generally tend to cost more than £10 and the length of a course depends on the smoker involved. But Deborah Arnott from Action on Smoking and Health said: "What worries me is that many smokers who could benefit from this may not find out about it. "The advertising campaigns, which have been so important in the past in getting smokers to take up these sorts of offers and to go to smoking cessation services are not being run any more as they have been cancelled by the government."